Oh whoa is me! It has finally happened! I was impaled by my knitting needle! A little more than a year ago I picked up knitting as a hobby. I was, then, fearless and tried out all different types of knitting. I even tried the scary double pointed needles. I wasn't scared. And in fact I mastered the pointy devils by knitting up a baby hat for my cousin's little bundle of cuteness, on my very first try. Not once did I think that these things, or much less this hobby, might hurt me. I have been injured while playing sports such as in cheerleading and soccer. 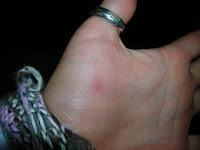 Heck, I've even been injured by watering my plants... yes, I don't know how I do it either. But this one was due to watering the plants and falling off the couch. All I know is this leads to expensive emergency room bills, a sprained ankle, and a couple weeks on crutches (nice knitted crutch cozys for my armpits didn't even help me). But now... I'm scared. 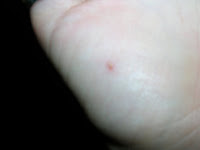 I have been impaled by one of my double pointed needles. Actually, it really didn't hurt as much as you would think a sharp stainless steel needle would feel as one clumsily places one's hand on top of while sitting down. Really it was my fault for leaving my knitting on the floor, but I place blame on mum's damn sock! 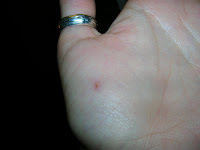 This stabbing wound of mine made me wonder about case studies with knitting needle impalement. Me being the geek that I am, pubmed'ed and medline'ed (yet more verbs I have quite eloquently made up), knitting and injury, to find case studies of knitting injuries. Surprisingly (or not), there are a number of reports as Ratan et al (2005), and Heath (1980), where injuries are caused by knitting needles. Another report of injury to specific areas, such as the tympantic membrane due to a puncture with a knitting needle (Vanderstock et al., 1983). And there is a report of accidental death, a case study by Payne (1966), which describes a dreadful incident where a 13-month infant was killed by a puncture wound from a knitting needle causing a lesion in the occipital lobe. Then there are a number of other reports of self injury with knitting needles. Such as the hypochondriac man who inserted a knitting needle in places where you would want your nice merino wool to go (Walter, 1991). And I found another case that was very disturbing. Peschel et al. (1997), describe a schizophrenic patient who used a knitting needle to repeatedly puncture wounds into the forehead causing cerebral hemorrhaging. And there is another case study from Yuksel et al (2008), that suggests that a 12-year old girl suffered from a right sided radial nerve injury causing numbing and weakening of her right hand, due to excessive knitting! Have I picked a scary hobby or what? And who says knitting is for old ladies in rocking chairs?! Dude, after reading these case studies, I think it takes some balls to knit (I would say pun not intended, but again, I'm wicked geeky like that). I was injured in the same way just a few months ago. I think there should be some kind of warning label on DPN! I stepped on a knitting needle last night. Good to know that I will probably live through it!